The Defence Act of 1909 required that every Australian youth participate in military training. Junior cadets (aged 12 to 14) chiefly trained in schools while senior cadets (aged 14 to 18) were meant to complete 64 hours of training a year in organised companies and battalions. The Citizen’s Forces (for 18 to 20 year olds) were to do 16 days training a year, eight of them in camp. Training areas were established in Perth, North Perth, East Perth, Subiaco, Guildford, Victoria Park and Fremantle, as well as Kalgoorlie, Boulder, Albany, Geraldton and Bunbury. Typical training included parades, drills, rifle exercises, physical training, organised strategic games and examinations. By the early 1930s, most of the training for both the Citizen’s Military Forces (CMF) and the smaller Permanent Military Forces (Militia) was held at Karrakatta. Facilities were limited and it was realised that the Citizen’s Forces would have to go into regional areas with different terrain and conditions if the standard of training was to improve. The 1933/34 annual camp was held at Northam and the success of this and the camp at York the following year proved that to the authorities that they should establish a semi–permanent military camp in a regional area. Act as a receiving camp for reinforcing troops in case of invasion. The site was to be 30 to 50 miles (50 to 80 kilometres) inland, protected from view, have excellent road and rail communication in all directions, and provide training facilities with easy access to likely points of landing by hostile forces on the Western Australian coast. As the deciding factor was a reliable water supply for 5,000 men, the site had to be served by water piped from the Darling Range. The Assistant Adjutant and Quartermaster General of the 5th Military District (Western Australia), Lieutenant Colonel GFG Wieck was tasked to explore the country between Pingelly and Goomalling. When he reached Northam on Easter Sunday 1935, Lt Col Wieck enlisted the assistance of Squadron Sergeant Major Tharkrah of the 10th Light Horse (and traffic inspector for Northam Town Council) to inspect the eastern foothills and slopes of the Darling Range around Northam. They selected a site to the south of the Great Eastern Highway near the Goldfields Water Supply pipeline. Northam Town Council granted the Commonwealth a lease over the land, which included part of the Northam Town Common. The lease was for 20 years with the right of renewal, at an annual rent of £15. 1934 Training Camp at Northam. Courtesy M Weick. The decision was quickly made to hold the 1935/36 camp at Northam. 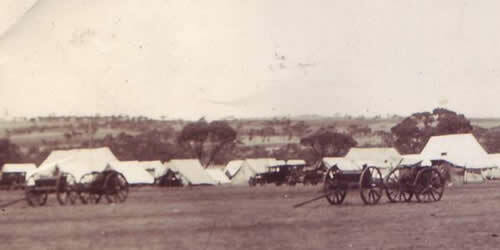 With the aid of detachment of gunners from the Fremantle Artillery Barracks and horse teams from the Guildford Remount Depot, enough land was cleared to hold a tented training camp. When war was declared, the Militia was put into camp at Melville for three months. When the camp ended, many decided to enlist in the 2nd Australian Imperial Force (AIF). Phil Loffman describes the accommodation at Northam Army Camp during his time as a cadet in the late 1930s and later with the 2/28th CMF. Phil Loffman interviewed by Judy Durey for Murdoch University & NACHA with sound produced by Rob Muir, 2008. Ray Middleton tells us about volunteering at 16, his first camp at York and then the annual camp at Northam. Wayne Gardiner describes the buildings of Northam Army in 1936 when it was a highly regarded camp site with modern buildings.